Our state bird is the Carolina Wren and the state dog is a Boykin Spaniel. Draw a picture of what you think these look like. After you have drawn your picture, look up information about South Carolina animals to see if you were correct and to learn more about South Carolina animals! The South Carolina state butterfly is the Eastern Tiger Swallowtail! 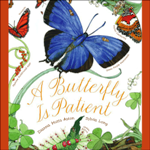 Learn about all kinds of butterflies by reading A Butterfly is Patient by Dianna Hutts Aston; illustrated by Sylvia Long. Print and color this coloring page with our state flag, state reptile, and state fruit! Learn more about South Carolina animals and plants.